For me the image of Turkish wine is – or was - rooted in singularly unpleasant holiday wines from shops that stored bottles for too long in sunny windows and sold them overpriced to sunburned tourists on holiday. But the amazing wines of Chamlija which I encountered last week have shattered that misconception more effectively than the world’s ugliest and unluckiest iphone looking at itself in a mirror. Just south of the Bulgarian border, firmly in the European part of Turkey north of Istanbul, Chamlija is a new winery, from the third generation of the Camlica family to farm in this part of the world. The elevated vineyards on the foothills of the Strandja Mountains are further cooled by breezes from the Black Sea. The hottest these vineyards get, even in August, is 28°C, massively cooler than the maximum experienced by the Rhône and Provence, and really no warmer than the potential in even Northern Europe. The wines are elegant styled but nevertheless capture the sunny ripeness of the region. 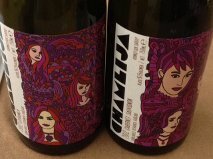 Mustafa Camlica is the man behind this ambitious new winery project, named Chamlija, after his daughter, a talented artist who designs all the eye-catching labels. The wines are sensational, and deservedly did very well in the BIWC (see previous blog). Narince (pronounced Narange, sort-of) is a deep, golden almost orange coloured grape, which shows in the hue of this full flavoured, rounded wine. The flavours of peach and warm citrus are complement by a refreshingly crisp, bitter-edged orange peel touch. It’s delicious, and would cope with rich and even quite oily aubergine and olive dishes. I’m informed that Narince is also the grape variety whose leaves are most in demand for dolmades – to the degree that some producers lose their crop of grapes to excessive leaf poaching. There’s a movie in that somewhere! Against a lot of stiff competition, this wine was an easy winner of the White Wine Trophy in the Balkans Wine Challenge this year, and it deserved to be. The crisp and citrus fresh Sauvignon aromas and flavours are complemented by a mineral depth and understated lemongrass leafiness that keeps the wine super fresh. The acidity in the grapes was in fact so high that in this vintage Mustafa elected to include 15% Viognier in the blend to soften the wine. But this has worked so well that I cannot help thinking he may decide to keep it this way in future – the floral apricot hints just offsetting the lime notes of Sauvignon. This is a truly classy wine that stands apart from the austere style of France and the tropical expression of New Zealand. Yep – Albariño! This was a ‘secret’ wine that Mustafa let me try – I’m not sure that it’s destined for commercial release, not yet anyway, but for a wine from obviously young vines, it is a triumph. Like some curious cross between the two above, this had the weight and depth of candied citrus that Narince produces with leafy, nasturtium leaf freshness and a peppery herbal finish. A blend of Bordeaux varieties, this is deep and spicy and both its oak and ageing potential are apparent from the aroma. It has power and structure as well as rich, spicy fruit. Retains an elegance in the mouth - a legacy of the relatively cool vineyards. Really good. This was similarly youthful tasting, but rounded and deeply fruity with blueberry and plum flavours as well as a spicy, smoky note. The texture and balance are very good, and the wine has a long finish. I am really taken by Mustafa’s wines. They taste as good as they look (which is really saying something) and would be worth searching out, even if they had to come from the UK. Definitely a winery to watch!